"DAL2168 Heavy, Minneapolis ground, runway 30L taxi via A." "DAL2168 you can either have 30L, for the shorter taxi, OR you can have 17... but I don't really recommend that because it a much longer taxi. And I have to issue a new departure routing that is specific to that runway. But it's really up to you." Please ask yourself: Which controller would you rather be, and which one would you rather have working you as a pilot? I've noticed a trend lately on the network where controllers tend to think the more words, the better, even though 90% of the words are useless. The example above is merely that: an example. But I have heard many many different types of situations where this happens, and they get way too complex with controllers and pilots playing 20 questions on the frequency during an event where many airplanes are either waiting for clearances, or waiting for instructions. Folks, I'm all for being nice on the frequency, but we aren't customer service representatives. I constantly hear people push for realism, then I immediately hear this weird technique online that usually involves phraseology that is found nowhere in the .65. And to everyone who agrees, be part of the solution. Sometimes people making these mistakes don't even know they're doing it wrong because its the way they've been taught. File feedback, its what the system is for! You've got a good point, Shane. I've been guilty of this every once in a while. Most of the time I hear this, it seems that it is a new controller, who is uncomfortable working the position. They, therefore, talk themselves through what they need to be doing, but on frequency, with pilot interaction. Is this a good practice? Probably not. How can we fix it? No idea. You make a valid point. I would say to remember there is a time and place to use nonstandard phraseology. On VATSIM most pilots have no training. Most controllers can think of situations where a pilot on the network simply didn't understand a piece of phraseology. In these situations nonstandard phraseology is needed. In addition to this the .65 is not an end all be all. There are times where no standard phraseology exists for what needs to be said. Maybe this is starting to veer off but i'd add that while a controller may not be a customer service representative they do provide a service. Too often I see controllers unwilling to deviate from the norm because of a lack of comfort doing so or what have you. Using something like the MSP example above...i've heard multiple times where a pilot may request runway 17 but if 30L is the norm than that request would be denied even if traffic permitted. If traffic permits and a pilot wants a opposite direction approach or departure why not grant it? Opposite directions ops can be extremely common in the rw with flight training ops. Additionally if traffic is light, why not see if the a/c would like a shortcut rather than forcing them to comply with entire procedures. Where this can connect back to the heart of the thread is that many of these situations, in particular various solicitations of what a pilot may or may not want do not come with standard phraseology. A controller needs to be able to use judgement and not be afraid to deviate from the norm in order to provide the best service possible. Controller I want to be: Depends on my mood and traffic load, honestly. If it is busy/ an event, probably the first example, if it isn't busy, I'm bored/ feelin friendly, then maybe choice 2. Controller I want working me: Honestly, I don't care. I'm answering based on your examples, but I see your point. The examples are bad. Somebody offering a choice in runways isn't exactly the end of the world. I've dealt with worse on this network. Telling a long riveting story while vectoring a bunch of aircraft, that's where this would be an issue. Most controllers can think of situations where a pilot on the network simply didn't understand a piece of phraseology. In these situations nonstandard phraseology is needed. In addition to this the .65 is not an end all be all. There are times where no standard phraseology exists for what needs to be said. Shane, I disagree with you on the customer service initiative. While customer service has a slightly different meaning in this environment, I think that it should mean that as a controller we do our best to provide the best service that we can. Good phraseology is always good but there are times especially with an inexperienced pilot that a little more detail may be necessary. That is where the customer service comes in. Take into account VATSIMisms such as what scenery does the guy have, or what weather is he using etc. Good points made in the other comments. A couple of tips that I have - Shane not to pick on you as you and I have had this conversation before. You are a real world controller, many people on this network look up to you for that so when you encounter a controller who may be off with their phraseology in many cases it would mean more to have somebody like you mentor them and offer some friendly advice (Good Internal Customer Service). This applies to everybody of course. As a pilot one issue that I encounter a lot is controllers who are so ramped up on the realism kick and are trying to duplicate what our real world counterparts do, they talk so fast and away from their mic that as a pilot I cannot understand what they want and therefore have to ask them to repeat. So I encourage all controllers and pilots to slow down a little, speak clearly and make sure your mic in close to your lips. (Good Customer Service). The point is to use proper phraseology first, and then go back and use plain English and be as polite and add as much as you want, but phraseology first. I am more than willing to repeat myself and explain the phraseology if it is not understood by someone who is new or unfamiliar, but I will always say it correctly first. You are correct with speech rate. Slow is smooth, smooth is fast. Exactly. If traffic permits giving the pilot an option, give them the option. And extra verbiage is nothing more than an annoyance until it begins to hinder the efficiency of the operation. If I have to wait an extra 30 seconds for a taxi instruction, that means the guy behind me also has to wait, and guy behind them waits as well. Saying extra words during event scenarios have a larger impact that people realize sometimes. In addition, with how hard it can be to understand people on the network, extra words that the pilot isn’t expecting is just asking for a misunderstanding, or having to repeat something. Mark, the whole point of this post was to spark a healthy discussion with the hopes of newer controllers reading it, learning, and WANTING to be better. It’s inefficient to file feedback for every single controller that could improve on the network, when one post on here might reach many at the same time. I agree about duplicating real controllers. Sometimes on the network I hear things that must’ve been heard on liveATC, or YouTube, and they thought it sounded cool, so they’re incorporating it on the network with the logic that, if they did it in the real world, that means it’s a good thechnique! You make a good point about the customer service just being different. Good customer service on the network can definitely be executed by controllers by doing everything they can to do the best they can. Which inevitably involves setting aside ego, and continuing to improve! we aren't customer service representatives. That being said, I will agree to a point to what you're saying, but it'll depend on load. If I can accommodate anything, I'll often ask if they have any specific preferences, and I'll give it to them. During an FNO? You're likely getting an instruction. If you ask for something, however, I'll give it to you. Regarding the phraseology? That's not all that bad. It may be wordy, but the .65 doesn't tell you how to ask a pilot for a preference. The .65 isn't all encompassing. 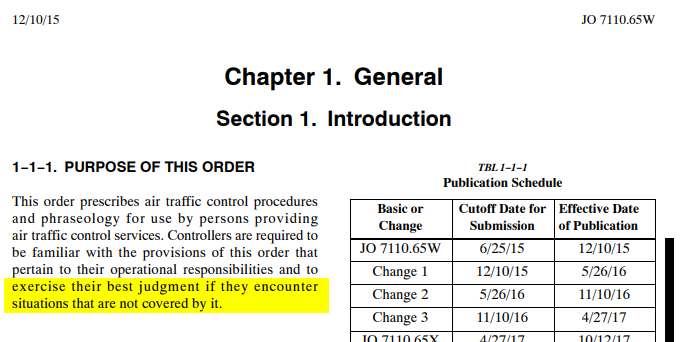 In fact, 1-1-1 (Purpose) makes that pretty clear when it goes on to tell controllers to "exercise their best judgment if they encounter situations that are not covered by it." The example would be one such situation. This is a hobby. It's supposed to be fun, and sometimes that breaks the mold a little bit. 99% of the time, we don't see enough traffic that I should ever have to deny a request. Plus, most of these new kids are still suffering from mic-fright, so by providing the opening and opportunity, they may learn to ask for what they want instead of acting like a rag doll, assuming that ATC is the end-of-the-line, final authority. I remember being young and new on vatsim, unsure of what was what. Who did what, and whether or not the controllers were allowed to throw me in jail for upsetting them lol -- And that's where my style has developed from. Let's make it easier and more fun for the next crop of pilots and controllers alike. Hyper-realism and pretending that we can't make them feel special by means of letting them ask for things is contrary to the that goal and the objectives of the network. As I mentioned in my other reply, the .65 doesn't cover how to ask pilots the question in the example. Controllers have to know how to effectively go off script. The .65 says so. Matt, you needn’t quote me the .65. Believe me, I know there is no good way to ask questions, and there are few prescribed phraseology examples for when you do. Half of what I do at work is ask “Would you like to go up or down 1000 feet for direct of flight/next sector request?” I try and be concise as possible while still offering the pilot their preferences. I could easily just decide for them. While the original post contains more specific examples to asking questions the point I am trying to communicate is that the frequency shouldn’t be dominated by over the top customer service drawn out at length. It should try and be more to the point. Yes, be polite and courteous, and endeavor to help people learn, by it need not become a standard to have a 5 second question turn into a 45 second monologue. DAL123 would you like 12L or 12R? Short and sweet. Unfortunately most of the responses here aren’t arguing the original point of this thread. I accommodate request all day every day if workload permits. My point here is that less words is better. I’ll never argue that we should deny requests for no reason. So to continue the discussion: more words is better... yes or no? i've heard multiple times where a pilot may request runway 17 but if 30L is the norm than that request would be denied even if traffic permitted. If traffic permits and a pilot wants a opposite direction approach or departure why not grant it? These two quotes right here are prime examples of the pilot bias that has been growing within the division over my 12 years on the network and why senior controllers are leaving in droves. These quotes completely ignore the fact that the controller has put hours of study into basic theory, procedures, and technique for no pay. They have done so out of a desire to learn Air Traffic Control and be able to practice that skill on VATSIM. A controller derives his enjoyment from working his airspace efficiently and providing a realistic simulation of procedures followed by pilots and air traffic controllers everyday around the world. In layman's terms, a controller want's to work his airspace the way it is supposed to be worked! That's what is fun for them. So yes, I'm going to use proper phraseology when I control. No, I'm not going to give you your choice of runway immediately nor acquiesce to your ridiculous deviation request right off the bat regardless of if I have 1 airplane or 100 airplanes. I'm going to assign per my SOP and if that doesn't work, we will find a mutually beneficial way of getting you from A to B and I'll use my best judgement if we need to deviate from Plan A and find a way that works. I'm going to move you as expeditiously through the NAS as I can. You're going to follow my instruction unless it causes a safety issue or is not possible, then it's your responsibility to say unable and we find another way. I'm going to enjoy providing Air Traffic Services to pilots on VATSIM. You're going to enjoy flying on VATSIM with ATC. I won't control if it's not enjoyable. You won't fly with ATC if it's not enjoyable. I can't provide ATS unless you fly. You can't have ATS unless I control. See, it's a two way street. We're in this together and we both need to derive enjoyment from it for the network to survive. These quotes completely ignore the fact that the controller has put hours of study into basic theory, procedures, and technique for no pay. What I said in no way indicates a pilot bias. It comes directly from what I see almost everyday at work. In the context of my entire post I state a main reason for using nonstandard phraseology is due to issues on the pilot side. If a controller decides to deny a pilot request for no reason other than their SOP indicates something else is preferred than in my opinion they have failed to actually grasp the theory and technique behind what makes air traffic work. Did I say deny a request for nothing other than SOP? No. What I said was I'm going to assign you SOP and if that doesn't work, then we work on accommodating your request. I'm not going to waste frequency time to figure out what you want. I'm going to give you what you should get then you will advise me if you want something else.